Dash of Green: Quilt Complete! So I'm happy to inform you that the quilt I started almost a month ago is finally complete! I present to you...Ella's doll blanket! 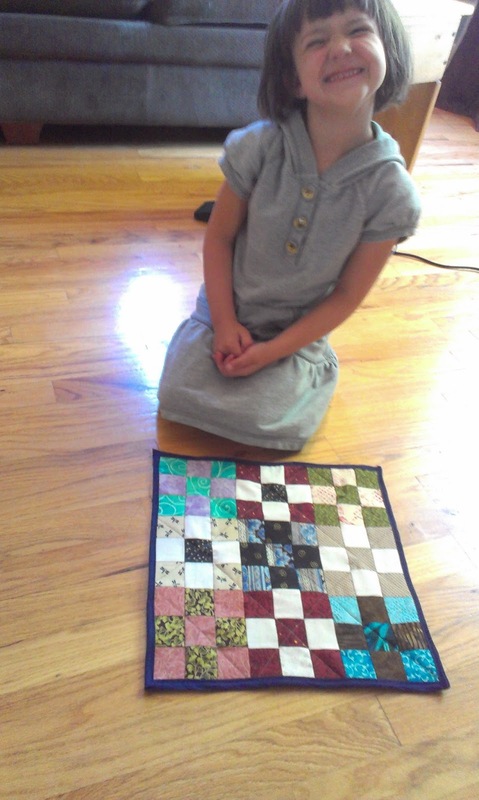 That is what Ella Rose finally decided she wanted to do with the quilt. Indeed, it's far too small for any real person to use...and yet too large for a potholder either. It was a great foot in the door of the wide world of quilting. 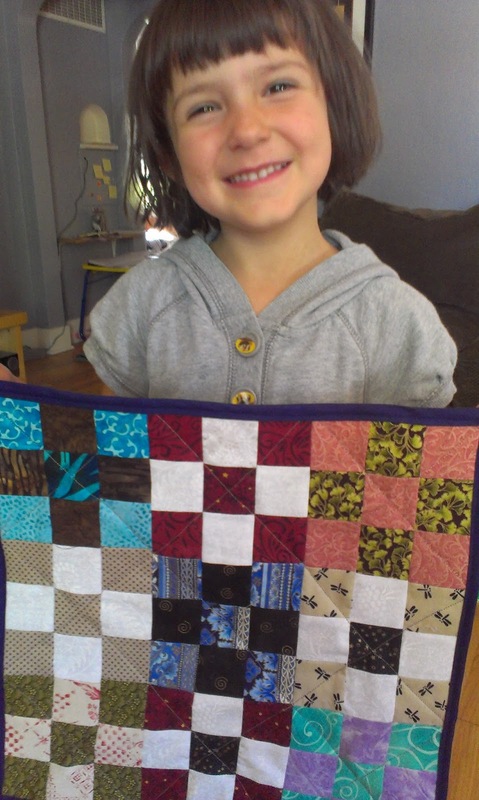 I finished the quilt first thing in the morning, and after that had a big ol' awesome day! Firstly, our house was bare so Dash took the kids to go shopping and we ended up breaking our fast around 10:30 -- oy ve! After that, I rode with the kids to the library, stopped by a friend's house on the way, and got to borrow a life jacket for William. Score!! I then wanted to get Ella Rose a life jacket, so we biked to Play It Again and picked out a nice pink one (it's gotta be pink for this girl!). William fell asleep, so back at home we had a li'l lunch and then a friend dropped by to catch up and chat. Not but 10 minutes after she left, another friend dropped by and we talked and whipped up deviled eggs and had a lovely visit. Then I brought the kids and deviled eggs to a Newcomers potluck in the park to enjoy the free concert put on by the Corvallis Community Band. We stayed there until 9pm and had a great time seeing other Newcomers, and playing on the playground. And just to throw in a little more EC progress -- no joke, William was dry and pottying perfectly all day, and only had two little accidents while at the park (it was already 8:30pm by then). So, yeah! Most of the day we were really grooving and then I think the park distracted him (us?) both so much, we just missed it. Though he did alert me immediately following the accident, as though to say "Mama, look. Pee!" Heh heh heh. Aaaanyway, I am bushed and I hope you all had a great day and are looking forward to a great week too. Until next time, take care and Happy Completed Quilts! !